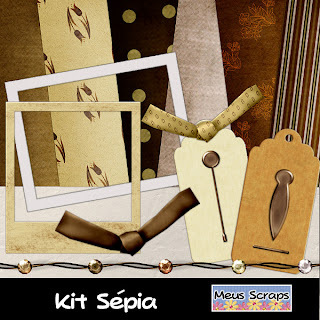 Seguindo a proposta do Cantinho dos Scraps , fiz o Kit Sépia . mas defenderei até a morte o vosso direito de dizer"
Carla your Sepia kit is fantastic! TFS it. very pretty, thank you so much! Thank you for sharing this beautiful kit. I really like the neutral color scheme. Beautiful colours, just what I love. Thanks so much for sharing! Thank you for sharing this most beautiful creation with us all. I love everything about it. Elegant! At 2:00 PM, ... that LadyD! Seu novo kit está lindo ! bjos e obrigado por compartilhar. Very Pretty Carla. Thank you for sharing.